By CNN'S JENNIFER HANSLER AND RYAN BROWNE CONTRIBUTED TO THIS REPORT. The US Air Force recently deployed six nuclear-capable B-52 bombers to Europe for "theater integration and flying training" exercises with regional allies and NATO partners -- a move viewed as sending a strong message to Russia, which is celebrating the five-year anniversary of its military annexation of Crimea. 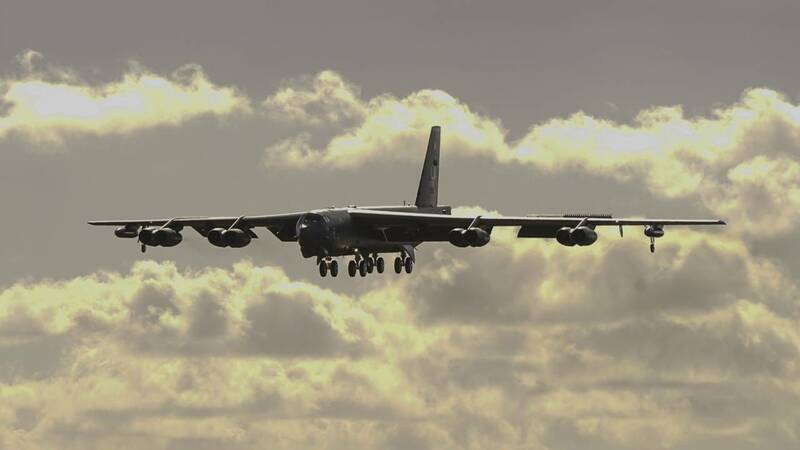 On Monday, four B-52s "conducted flights to several places in Europe, including to the Norwegian Sea, the Baltic Sea/Estonia and the Mediterranean Sea/Greece," the Air Force said. B-52 bombers from Andersen Air Force Base, Guam, and RAF Fairford have also conducted "simultaneous theater familiarization training in the Indo-Pacific and Europe" as bombers "flew north to an area east of the Kamchatka Peninsula," near Russia. "Collectively, the flights from the Indo-Pacific and Europe demonstrated US commitment to allies and partners through the global employment of military forces," the Air Force said in a news release. The planes have been modified heavily since the end of the Cold War and have been upgraded with precision-guided missiles, electronics and high-tech sensors. Each aircraft can carry up to 70,000 pounds of bombs, mines and missiles, according to the Air Force's official fact sheet. Tensions between the US and Russia have steadily increased in recent months following Russia's seizure of Ukrainian ships and detention of Ukrainian sailors after a confrontation in the Kerch Strait in November. Russia's actions and its detention of the Ukrainian sailors prompted President Donald Trump to cancel a planned meeting with Russian President Vladimir Putin during the G-20 summit in Argentina last year. But the top US commander in the region says it doesn't appear to be working. "I'm not comfortable yet with the deterrent posture that we have in Europe," Gen. Curtis Scaparrotti said earlier this month, warning that his command faced shortfalls with regard to land and naval forces as well as intelligence, surveillance and reconnaissance assets. "Of concern is my intelligence, surveillance and reconnaissance capacity given that increasing and growing threat of Russia. I need more ISR," he added. "In light of Russia's modernizing and increasingly aggressive force posture EUCOM recommends augmenting our assigned and rotational forces to enhance our deterrence posture," Scaparrotti said. This week, two Russian generals said Moscow plans to send nuclear-capable bombers and medium-range missiles to the peninsula -- but quickly retracted their statements. Still, NATO lashed out at Russia for its "wide-ranging military buildup in Crimea" and the US National Security Council said Monday that Moscow's annexation of Ukrainian territory "continues to pose a threat to our regional allies." While Trump's long-standing criticism of NATO over burden-sharing costs continues to hang over the 29-member military alliance, the US has increased its military presence in Europe during his administration as the US and Europe seek to counter Russia's actions in the region. US Special Representative for Ukraine Kurt Volker said on Monday that "there is no military solution" through which Ukraine could reclaim Crimea. "That would be militarily a disaster. It would lead to the loss of thousands and thousands of lives. It's not something anyone should be contemplating," Volker said on the fifth anniversary of Russia's annexation of Crimea. "So there's no taking it back by force," Volker said during a news briefing delivered by video feed from Brussels, Belgium. Volker said the US would be willing to provide additional arms sales "to help them develop a strong, capable, sustainable defense capability." He said "it's possible" that the US would provide more anti-tank systems as well as air and coastal defenses. On the possibility of Ukraine joining NATO in the near future, Volker said he couldn't predict. He noted it depends on "how quickly Ukraine can progress" on such issues as standards of democracy, anti-corruption and civil control of the military, as well as when NATO decides the appropriate time for a formal invitation. Volker said he hoped Russia would not react strongly when that happens. "What we have is not a lack of an appropriate format. What we have is a lack of political will from Russia," he noted of the political process.